K2C Compliance Suite for SharePoint is a set of add-ins that makes SharePoint compliant to 21 CFR part 11 or otehr similar regulations about Electronic Records and Signatures. You can use these add-ins both in SharePoint Designer and Nintex Workflow, where drag and drop and visual designer signifincantly improve the user experience. Electronic Signature, Digital Signature and PDF Converter can be used as single or combined actions to implement a paperles approval process fully complying with regulation requirements. You can purchase the entire Suite with a discount or each single product. The solution works with any kind of pdf file, even if protected or having a digital signature. The feature can be started from the document menu that is present in any SharePoint library. The user enters the required text and/or image, optionally adding an the current date, specifies the position, rotation, colour and font. A final preview allows to see the effect before saving or printing. The new version is available for SharePoint 2010, 2013 and 2016 and for a variety of workflow engines, including SharePoint Designer 2010 workflows (still present in SharePoint 2013 and 2016), SharePoint 2013 Workflows (available in SharePoint 2013 and 2016, based on new Microsoft Workflow Manager) and Nintex workflows. - A new web part can be added to any page to display all the all the Electronic Signature Records and related documents or items for a given site. This allows a better governance of all signed documents or records by top managers. - Improved safety and performance, becasue now all signature records are saved as a copy of task list where original task is created by the workflow. All features already included in previous versions are still present: unmodifiable signature records with timestamp, automated checksum to verify signature alteration, signing user, signature reason and full configurability of signature sequence as parallel or sequential actions. 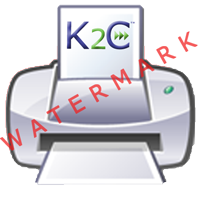 A free copy of K2C White Paper for SharePoint compliance with 21 CFR part 11 is now available. K2Pharma, the modular solutions for Life Science industries: Quality meeting Business!